April showers bring May flowers…isn’t that how the saying goes? It’s certainly true in Texas, where the winter rains bring the beautiful wildflowers of spring. 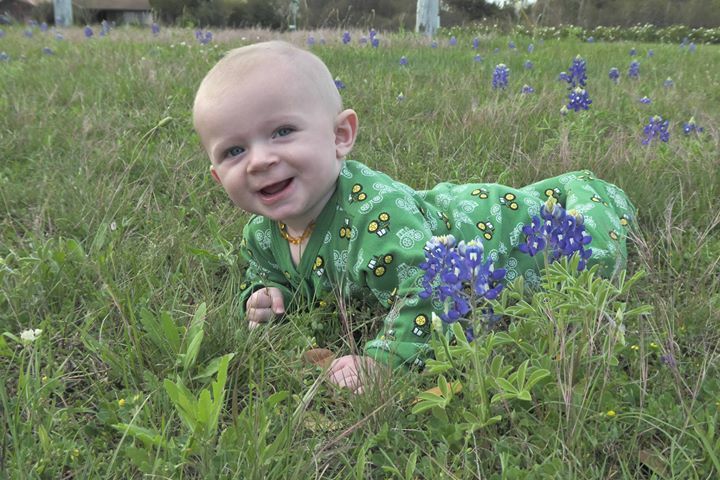 Taking your picture in a field of bluebonnets is a standard issue rite of passage for every child in Texas. 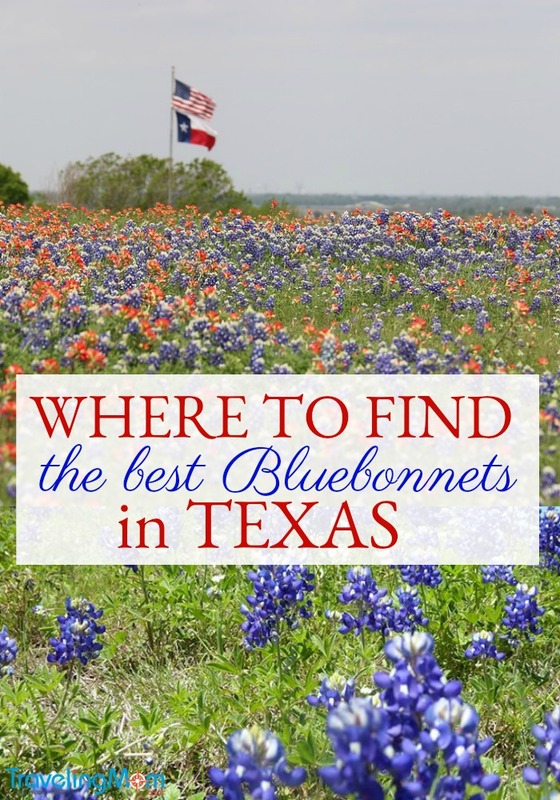 Our Texas Traveling Mom gives us the scoop on where to see Texas Bluebonnets this spring. Pictures in the bluebonnets are…well, sort of required…for Texas children. I’m pretty sure I’d get my Texas Mom Card revoked if I failed to get yearly pictures of my kids in the bluebonnets. Bluebonnet pictures are amazing for natives and visitors alike and, no matter where you live, they make wonderful Christmas card pictures. But, as beautiful as the pictures are, seeing these blossoms in person is a bazillion times better and a bazillion is like, a lot, y’all. Fields of bluebonnets line the rural highways in Texas, and we have directions to the best spots. 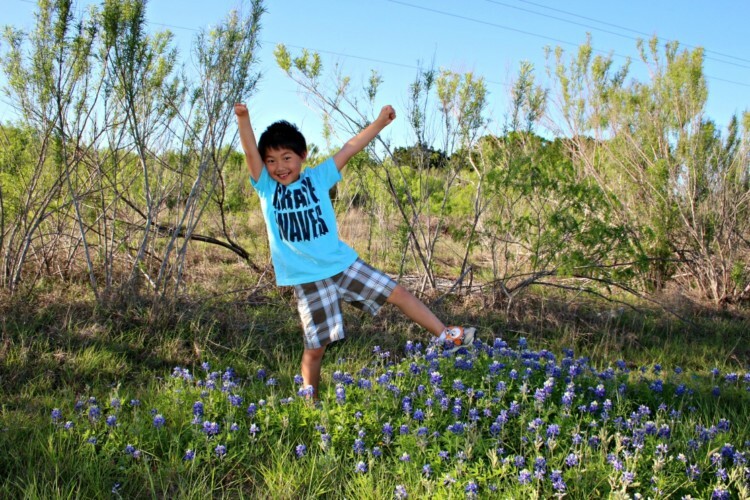 Follow TravelingMom Rebecca’s 8 Tips for Taking Bluebonnet Pictures to safely create your family’s bluebonnet memories. 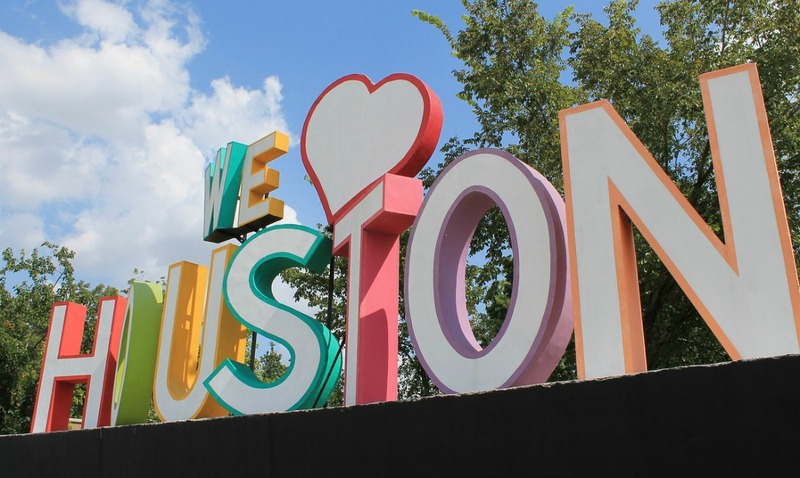 This post from TravelingDad Greg on “Bluebonnet don’ts” is also a great resource. 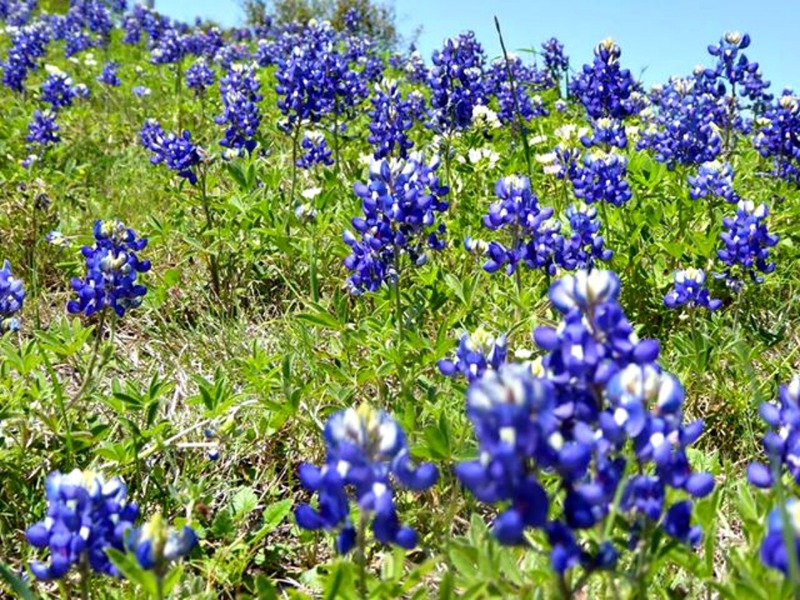 Take a day (or two) and drive through the Texas hill country on the Bluebonnet Trail. The best place to start the Highland Lakes Bluebonnet Trail is in Burnet. After all, it’s the Bluebonnet Capital of Texas. Burnet, Texas is located 60 miles northwest of Austin and directly west of Georgetown on Highway 29. Residents and visitors celebrate the blooming wildflowers at the annual Bluebonnet Festival the second weekend of April. From Burnet, head south on Highway 281 to Marble Falls. As you approach Marble Falls, look for the Bluebonnet House at 4554 N. US Highway 281. The mid-19th century abandoned home sits in a field of wildflowers and is a popular place to take pictures. While in Marble Falls, make sure to stop by the Blue Bonnet Cafe for a piece of their legendary pies. 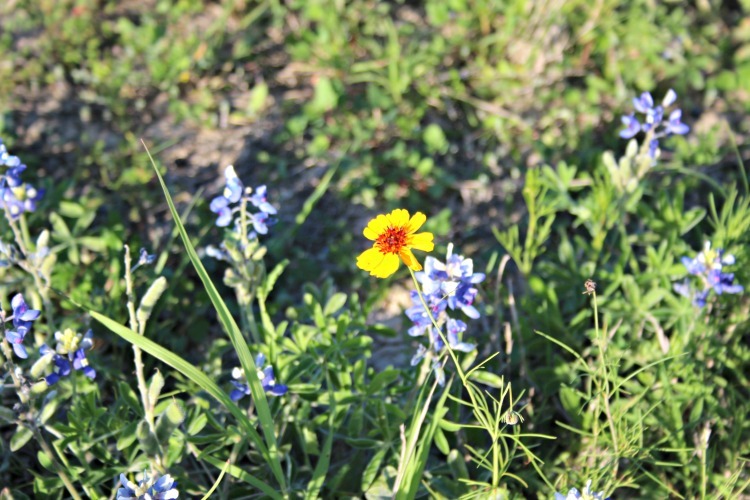 The Convention and Visitors Bureau has free maps of the Highland Lakes Bluebonnet Trail. TravelingMOM Tip: If you’ve got extra time, Fredericksburg and Johnson City offer a TON of stuff to do with your kids. From Marble Falls, head south on Highway 281 to Johnson City and then west on Highway 290 toward Fredericksburg. Make a stop at the Lyndon B. Johnson State Park and Historic Site to learn more about where the 37th president was born, lived, died and was buried. In Fredericksburg, shop the stores on Main Street and eat at my favorite German restaurant, the Altdorf Biergarten, at 301 West Main. When you leave Fredericksburg, head north on Highway 16 to Llano. After about 13 miles, go east on Ranch Road 1323 to Willow City. The Willow City Loop heads north and eventually loops back around to Highway 16 where you can continue your trip toward Llano. The loop is a scenic 13-mile drive filled with wildflowers. However, this land is private, so you are discouraged from stopping to take pictures. If the weather is good, consider a side trip to climb Enchanted Rock. If you’ve got some extra time in the area, check out this list of things to do. The last leg of the Highland Lakes Bluebonnet Trail takes you back west from Llano to Burnet on Highway 29 and past Lake Buchanan. Washington County is located on Highway 290 between Austin and Houston. It is home of Brenham and the Bluebell Creamery Tour. 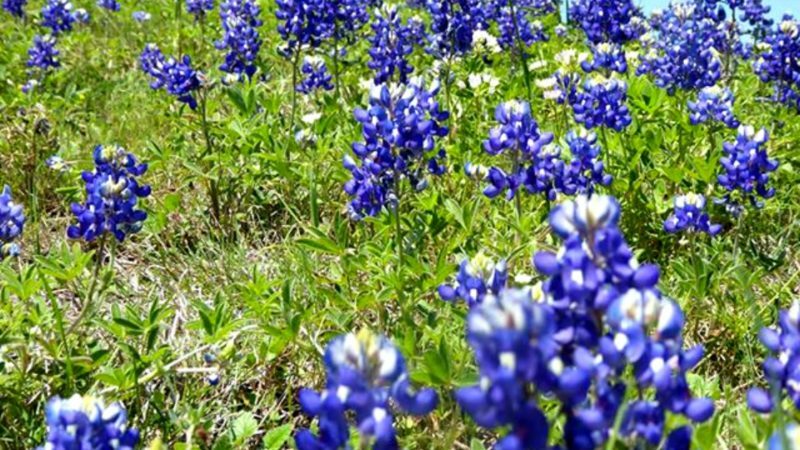 Each spring the Brenham Chamber of Commerce conducts a Wildflower Watch and posts bluebonnet sightings on their blog. Washington County is also close to treasure hunter’s mecca Round Top where you can stay overnight at the nation’s only indoor campground Lone Star Glamp Inn. Former First Lady Lady Bird Johnson and actress Helen Hayes established the National Wildflower Center in 1982. In 1997, the center was renamed the Lady Bird Johnson Wildflower Center and moved to 4801 La Crosse Avenue in South Austin. At the center, you can learn about Texas wildflowers, get ideas for you home garden, and walk the trails through wildflowers including bluebonnets. Kingsland sits on the banks of the Colorado River and Lake LBJ. The town’s official slogan is “Where the rivers flow and bluebonnets grow.” The best bluebonnets can be seen down FM 1431. There are abandoned railroad tracks that run through this tiny Texas town. Perfect for pictures! Brenham is on the map for ice cream (Blue Bell is made here and if you haven’t tried that, you’re missing out). This small town is the halfway point between Austin and Houston, this is an easy drive for many Texas (and visitors) to get bluebonnet pictures. Bluebonnets historically appear along Highway 290 East and FM 390. Brenham also has a Wildflower Watch website complete with a wildflower map. Off of I-35, take the Rueckle Road exit toward Highway 46. If you’re a San Antonio-area family (or visiting) this is a popular place and an easy drive. Ennis is known as the “Official Bluebonnet City in Texas.” Located south of Dallas, the Official Texas Bluebonnet Trail is said to be the oldest bluebonnet trail in Texas. The best way to find Bluebonnets? Worth of mouth. If you’re in Texas or plan to be during bluebonnet season, ask a local. The best bluebonnet spot within a short drive of my house is the slope behind Rolling Oaks Mall in North East San Antonio. Texas is a big state (you know what they say!) and there are tons of places to go to get beautiful pictures in the bluebonnets. And don’t forget the other flowers! Indian blankets, Mexican Hats and Drummond phlox may not be as commonly known but they are also pretty and very photo-worthy! Texas Bluebonnets are beautiful but there are many other wildflowers that bloom in Texas during the spring. Author’s note: This is an updated version of a post originally written by Kuleen Lashley. Such a wonderful road trip. Is there a good drive to see the bluebonnets in the northeast part of the state? It looks like the children enjoyed spending time outdoors! I didn’t know Bluebonnets looked that good til I saw it in the pictures here. Nice to know it’s located in many areas, so there’s a lot of places we can visit. The variety of choices would definitely come in handy so we can try a new place every so often. Just an FYI from an experienced mom: Watch out for fire ants when posing your little ones among the flowers. Nothing ruins the day like sitting your baby on an ant hill!! Happy bluebonnet-ing! !